Japanese recording artist and composer Kitarō performs main theme of the NHK Tokushu documentary series “Silk Road”. Music video by Kitaro performing Theme From Silk Road. Kitarō (born February 4, 1953) is a Japanese recording artist, composer, record producer and arranger who is regarded as a pioneer of New Age music. He is the winner of a Grammy Award and a Golden Globe Award. The Silk Road: The Rise And Fall Of Civilizations is an NHK Tokushu documentary series that first aired on 7 April 1980. The documentary was narrated by Ishizaka Koji with music composed by Kitarō, who insisted that the show be broadcast in stereo. The music was composed mainly using a Minimoog, Minikorg 700 and Maxikorg DV800. The series of soundtracks sold millions and the success created from the program brought Kitarō international attention. The NHK Tokushu and China’s CCTV documentary series The Silk Road began on April 7, 1980. The program started with the memorable scene of a camel caravan crossing the desert against the setting sun, with Kitaro’s music and a sense of timelessness. It was the start of an epic televisual poem. The first journey described in the series began in Chang’an (now Xi’an), at the eastern end of the ancient route. On 450,000 feet of film, the NHK crew recorded the path westward to the Pamir Heights at the Pakistan border and this material was edited to make 12 monthly broadcasts. In response to viewers’ requests that the series be extended to cover the Silk Road all the way to Rome, sequels were made over the next 10 years. Seventeen years after the program was conceived, the project was completed. The “Silk Road” was a series of trade and cultural transmission routes that were central to cultural interaction through regions of the Asian continent connecting the West and East by linking traders, merchants, pilgrims, monks, soldiers, nomads, and urban dwellers from China and India to the Mediterranean Sea during various periods of time. Extending 4,000 miles (6,437 kilometers), the Silk Road derives its name from the lucrative trade in Chinese silk carried out along its length, beginning during the Han Dynasty (206 BC – 220 AD). The Central Asian sections of the trade routes were expanded around 114 BC by the Han dynasty, largely through the missions and explorations of Chinese imperial envoy, Zhang Qian. The Chinese took great interest in the safety of their trade products and extended the Great Wall of China to ensure the protection of the trade route. 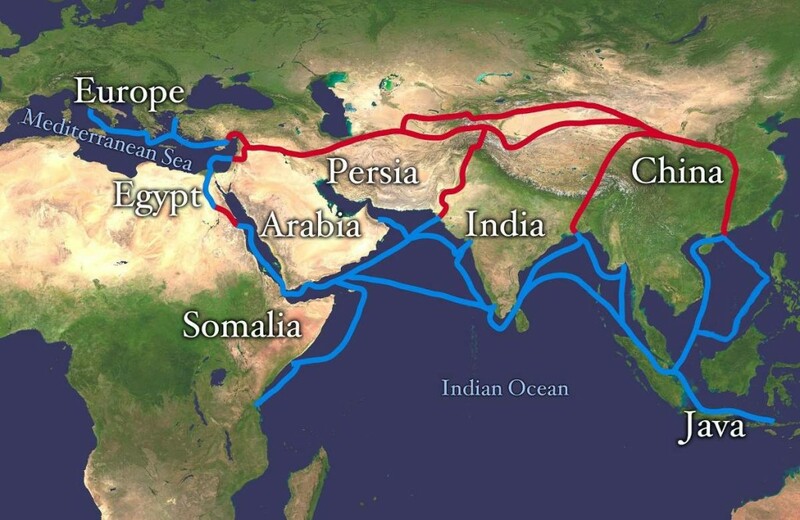 Trade on the Silk Road was a significant factor in the development of the civilizations of China, the Indian subcontinent, Persia, Europe, and Arabia, opening long-distance, political and economic interactions between the civilizations. Though silk was certainly the major trade item from China, many other goods were traded, and religions, syncretic philosophies, and various technologies, as well as diseases, also travelled along the Silk Routes. In addition to economic trade, the Silk Road served as a means of carrying out cultural trade among the civilizations along its network.